Nidhogg 2 looks... very different than its predecessor. Here's why. Grab that second controller and start planning the party — we are super-excited to say that Nidhogg 2 is launching August 15th, with pre-orders beginning July 18th. 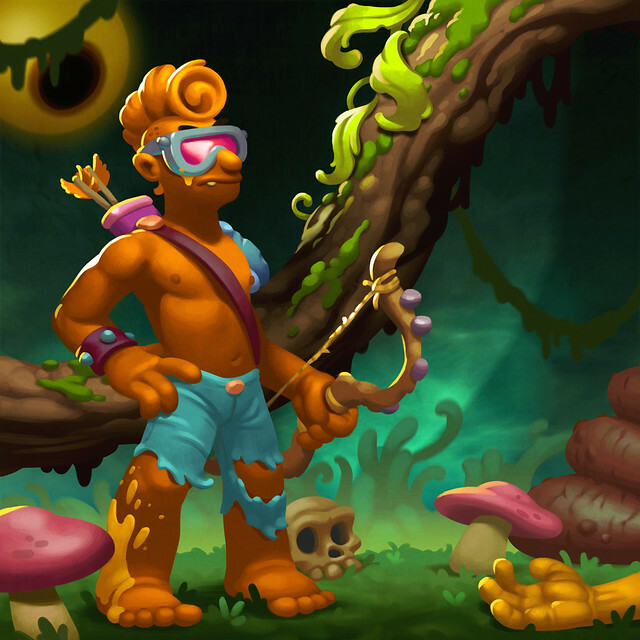 You may have noticed that Nidhogg 2 looks ever-so-slightly different from its predecessor. It’s the number one thing that people ask about, so Kristy and I wanted to give you the story behind Nidhogg 2’s art direction. We were proud of the original Nidhogg’s visual style, but that’s not to say we weren’t a bit surprised by how well the chunky, featureless pixels were received. We were pushing the limits of old-school aesthetics, after all. What many people didn’t realize was that Nidhogg’s style actually grew out of practicality more than some daring vision. Nidhogg was a game of fast reactions and precision, so fluid animation was a major priority. The flat style meant that I could iterate quickly, drawing and adjusting animations on the fly without having to worry about matching dozens of intricate design elements between frames. Rather than setting up mechanics and then moving on to art, I’m someone who needs to be able to tweak both constantly. The major drawback to this approach is that adding any sort of detail, like a piece of armor or a mask, means hours upon hours spent redoing animations again and again. While these limitations helped to define Nidhogg’s distinctive style, we felt constrained. When Kristy and I started thinking about Nidhogg 2, we looked back at our general to-do list from the original game. As always, there were a lot of items that had drifted from “Gotta hav this,” to “Wanna do this if we have time,” and on to “Can’t really do this, but man it would be cool.” Of everything on that list, a new animation process sat at the top. I had been experimenting with 2D bone animation programs, which allow you to independently animate separate body parts instead of redrawing entire character sprites. This makes it infinitely easier to combine things like fencing footwork, various upper-body stances, and weapon types. Plus, it means you can swap out the sprites without breaking the animation. It seemed silly to use all this potential on pixelated stick figures. So, instead of minimalism, why not try out some maximalism? Animated faces, sweet outfits and hairstyles, bustling environments – the doors had swung wide and Nidhogg 2’s visual style was born. While it might take a few moments to adjust to the new look, we think you’ll enjoy this lively new world with all its visual absurdity and fun character possibilities. I know that we’ve certainly had a blast creating it. Thanks Foxx, can’t wait for you to check it out. Too bad no Vita support. This would be great on a handheld. Is it coming to the Switch? The art style is really great! Looks clay-like but pixelated, so strange but nice at the same time. Hopefully I will get it on launch, was wondering what tool did you use to put together the scene and the characters? They look easy to use. Our lead artist Toby Dixon is a fan of claymation. For the character animation we use a program called Spine (which is amazing), then in the game we switch out parts based on how players customize their character. The game is coded in Game Maker, like with the original and our other PS4 game Flywrench. In the original game we made use of Game Maker’s built-in level editor, which requires you to re-compile the game to see any changes you’ve made. I made this level editor tool myself so that it would be easier to test changes while I’m playing the game. It’s also helpful for mirroring the rooms, so if I make a change on the rightmost rooms it will copy that change to the leftmost and vice versa. Thank you so much Mark for the answer, will have a look into Spine and Flywrench too! Success to your team! The first Nidhogg was awesome and I’m definitely excited for this one as well. Loved the first game, but I’m not a fan of the character designs in this one at all. Not sure I can look beyond it. Hey thanks for playing Nidhogg 1, hope you will give #2 a shot! I am three tons of pumped to played this! Thank you for creating the first one and for deciding to make the second one! You are doing great work and the look of the game is GREAT! Every time I see or hear about 2, I get a little more excited. It was super cool to see the game played on EASYALLIES as well! So much excitement to be had. I’ll be sure to introduce my friends to this one just as I did with the first one. Cool, thanks for playing! I look forward to destroying your friends in matchmaking. Loved the first one, really not feeling the art style this time. I’m not a fan of the new art style, it just doesn’t depict the raw fun, excitement and hype you can get from playing the game. I wish it looked better but just cleaner, not like a flash game with inspiration from Wallace and Gromit. The art style surprised me at first, being a huge fan of the first game, but it has grown on me each time I see it. Besides that, I promised myself long ago that if you ever released more levels for 1 or a full-on sequel I would be there day 1; can’t wait to get my hands on this. I received far more joy out of that $11.99 game than I have so many $60 games. Hell, I used to bring it to work whenever I worked weekends and we’d have tournaments. So glad to see another Nidhogg game in the future! The first Nidhogg seemed like it was pushing the boundaries of an 8-bit aesthetic, and this one looks 16-bit (or more, really). It’s also nice that you guys left an explanation for how you ended up with the art direction you did, it’s always interesting to see learn about the process behind game development. Wish you all the best! Art style threw me off at first, such a stark contrast to the original, but it really has grown on me. I loved part 1. Really excited for this one!! Ultra hyped for this! Love the new style!